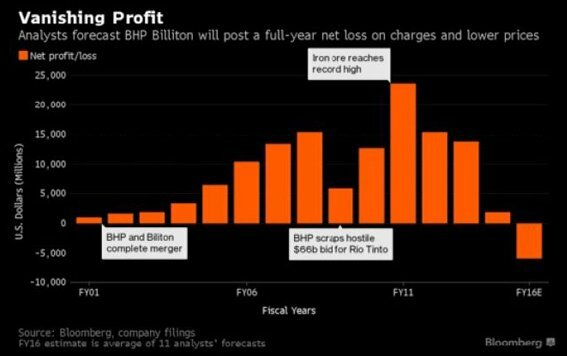 BHP Billiton (ASX:BHP) has posted its first full year loss of US$6.38bn (AU$8.29bn), making it the company’s first annual loss since BHP and Billiton merged 15 years ago. The recent slump in commodity prices are a major factor for the 31% drop in revenues, wiping US$10.7bn off pre-tax earnings. All was not bad news according to BHP chief executive Andrew Mackenzie who highlighted that during the financial period production costs were reduced and efficiencies increased. The company has lost half its value in recent years, going from record profits to now a loss in only five years. At the time BHP’s profit peaked in 2011 at $22.5bn and became an Australian corporate record. So what led to the recent fall from grace? Aside from the plunge in commodity prices that has affected the entire mining sector as a whole in recent times, there were some factors specific to BHP that resulted in the disappointing figures. The financial year just ended saw BHP write down many assets as one of costs. The value of BHP’s US shale oil and gas assets being cut US$4.9bn, the Samarco iron ore dam disaster costing the company US$2.2bn and money was set aside for global taxation reassessments totalling a further US$570 million. The move into US shale turned out to be disastrous for BHP, with the per barrel oil price now under US$50, pricing out the non-conventional method of extracting the resource. The flow on effect from hit dividend payments, with the mining giant declaring a fully-franked dividend of only US$0.14, down 77% from the previous years’ payout of US$0.62 per share. It should be noted that share prices are subject to fluctuation and investors should take a cautious approach to any investment and not base that decision solely on historical price movements. However it’s not just investors that are hoping BHP can turn things around. Being one of the largest taxpayers to the Australian Federal Government, there is a lot riding for the Australian economy on BHP’s success. For every US$10 a tonne movement in the iron ore price, $1.4bn of the federal budget is effected in the coming financial year and $3.9bn the year after. The market was seemingly unaffected by the news of the loss, having already priced the anticipated negative results into the share price that is currently hovering around $21 and trending higher. 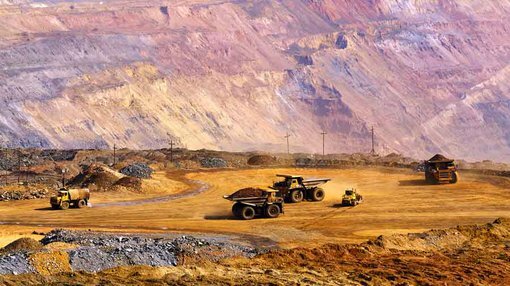 Will BHP bounce back in the 2016/17 financial year?